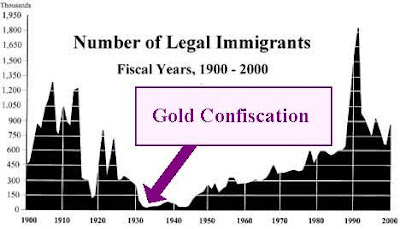 Blanchard Online asks could gold confiscation happen again? With the dollar growing weaker and the price of gold skyrocketing, could we see a repeat of the 1933 gold confiscation? The eventual result of the Bailouts will be inflationary and will further weaken the dollar. The flip side to a weak dollar is a rising gold price. All other things being equal, gold will continue to climb higher as the dollar moves lower. Today, just as in 1973 when gold began its last, big bull market, gold and the dollar are competitors, riding opposite ends of an economic seesaw. In the 1980s and 1990s, gold languished and was replaced by the dollar as the standard against which all things financial are measured. In the coming years, as the dollar suffers one of the great meltdowns in monetary history, gold will reclaim its place at the center of the global financial system. Gold's value, relative to most national currencies, will soar. However, the monetary crisis that will make your gold extraordinarily valuable will also create the very situation in which the government could return to some version of the gold standard, which would require that central banks enlarge their stocks of gold, increasing the gold price. The problem is that the very circumstances that would make your gold so valuable could also result in its being taken from you. In 1933, in order to stabilize the monetary system, President Franklin D. Roosevelt, under Executive Order No. 6102, confiscated all privately owned gold in the United States. Could it happen again? No two currency crises are exactly alike. However, it may be important to consider the reason why confiscation or expropriation is even relevant: the fact that, if it eventually became necessary for the U.S. to bolster a collapsing dollar with gold, we no longer have enough gold to do so in any meaningful way. As our debt and deficits have soared over the years, and as more and more dollars have been created, U.S. gold reserves have disappeared. In 1950, the United States Department of the Treasury owned 68.2 percent of the world's total gold reserves. Today, the Treasury owns less than 28 percent [Incorrect. The US has leased out this remaining gold and is net short gold via its big commercial banks]. 1) FDR's gold confiscation was small, only 110 tons of gold. By contrast, the US would need to accumulate at least several thousand tons today, something that will likely be much more fiercely opposed. 2) In 1933, the dollar was on the gold standard backed by 5800 tons of gold in US vaults, so those turning in gold for dollars only experienced a 69% loss. Today, any gold confiscation would result in 99.9% losses and would be seen as blatant theft. 3) Finally, the biggest reason a gold confiscation is unlikely is dual citizenship. A) Confiscate the gold of non-US citizens as they leave the country. This would not go over well with the rest of the world. In fact, the US would probably face crippling sanctions and/or an oil embargo if it tries to steal the gold of non-US citizens. B) Allow only non-US citizens to leave the country with gold. This solution would be incredibly unjust to those without dual citizenship, and American voters will object. Finally, when it comes right down to it, the US is in no position to confiscate gold. The US owes gold to Europe (gold swap and gold leases to US banks), is addicted on foreign oil, and is dependent Asia's cheap consumer goods. The world is unlike to tolerate any gold confiscation which extends to dual citizens, and the American voters are unlikely to tolerate any gold confiscation which excludes dual citizens. Hence, no gold confiscation. In response to the comments below, I am expanding this entry. First, I want to stress how different the US is today compared to back then. In the past, the US was far more xenophobic than most people realize. To give you an example of how bad it was, consider this: In 1858, Calif ornia passed an outright ban on all people of "Mongolian" (Chinese) descent, except in cases of shipwreck or accident. Some states took immigration policy into their own hands. In 1855, California levied a fine of $55 per person on Chinese immigrants. Three years later, when it was clear the fine had not stopped the flow, the state passed an outright ban on all people of "Mongolian" descent, except in cases of shipwreck or accident. Survivors were expelled as soon as they recovered. The city of San Francisco passed its own laws, taxing Chinese laundries and door-to-door vegetable peddlers. Perhaps most imaginative was a "queue" ordinance, which required a mandatory haircut for anyone convicted of a crime. This was aimed at Chinese, for whom it was a great disgrace to lose the pigtail. From 1854 to 1874, Chinese could not testify against whites in California courts. The legislature declared that Chinese "have never adapted themselves to our habits, modes of dress, or our educational system ... Impregnable to all the influences of our Anglo-Saxon life, they remain the same stolid Asiatics that have floated on the rivers and slaved in the fields of China for thirty centuries of time." In 1875 the US Supreme Court declared immigration a federal, not a state responsibility, but the US government picked up where California and other states left off. Beginning in 1882, it passed a series of laws barring Asians. The first Chinese exclusion act, in force for 10 years, was renewed in 1892 and 1902. In 1904 Congress made the ban permanent, and it was in effect until 1943, when China was our ally in the war against Japan, and a total ban seemed unfriendly [No kidding]. Japanese and Koreans tried to immigrate later than the Chinese, but got the same treatment. The Japanese and Korean Exclusion League, founded in 1905 in San Francisco, whipped up so much anti-Asian sentiment that Teddy Roosevelt persuaded the Japanese government in 1907 to withhold passports from anyone who wanted to emigrate to America — the so-called Gentleman's Agreement. The Immigration Act of 1917 created an "Asiatic Barred Zone" that virtually eliminated all Asian immigration, and also required literacy tests for European immigrants. Note decline during the First World War, and the success of the restrictions of the 1920's. The spike in 1991-2 is due to IRCA amnesties. If illegals are included, between 1970 and 1980, the number of foreigners living in the US rose by 47 percent (4.5 million). Between 1980 and 1990, the number rose by another 40 percent (5.7 million), and during the 1990s, increased by a staggering 57 percent (11.3 million, the largest single-decade increase ever). This meant that in 2002, 33.1 million immigrants were living in America — 11.5 percent of the total population [in 2007, 38.1 million foreign born people living in the US, about 12.5 percent of the total population]. Immigration drives US population growth. Since 1965, immigration and the children of immigrants have accounted for 70 percent of the increase, giving the United States population growth rates like those of Third-World countries. 1) Dual citizenship was a non-existent issue, and the clear distinction between Americans and non-Americans made it easy to confiscate gold. 2) An immigrant population making up just over 9 percent of US population. 3) The gold confiscation was small (110 tons). 4) The scale of the gold thief was also small (Americans were forced to sell their gold at a 43 percent discount of the future price of gold). 5) The US was self reliant (no dependence on foreign oil or consumer goods) while the rest of the world owed money to the US. So event if foreign government objected to the gold confiscation, they had no leverage whatsoever to do anything about it. 6) Finally, at the time of the confiscation, the US had one of the strongest currencies in the world: huge gold reserves, trade surplus, low levels of national debt, etc... The dollar's strength in 1933 meant hyperinflation was never an issue. 1) It's estimated that more than 40 million Americans are eligible for dual citizenship. This dual citizenship is a recent phenomenon, and I think that people are underestimated how big an issue this could be. Key point about dual citizenship: both countries don't recognize the second citizenship and act as thought it didn't exist. In other words, France recognizes me as a French citizen without acknowledging my US citizenship. Now imagine for a second that France starts demanding that thousands US citizens, including those living in the United States, turn over their gold, with no compensation, to the Banque de France to help the country fund its budget deficit. How do you think the US, struggling with its own budget issues, would react to this blatant theft of American gold? Remember, the US can't acknowledge that those Americans whose gold is being confiscated might also be French. 2) An immigrant population making up nearly 13 percent of US population. 5) The US is dependent on foreign oil, cheap foreign consumer goods, and foreign financing. Even mild sanctions could cripple the US's already weak economy. My point goes to Eric's contention that there is going to be some kind of outcry if the gov't tries to confiscate dual citizens' gold. First, there aren't that many of them (I mean dual citizens who are going to have gold). Second, there will be little sympathy for a) people who have gold, b) people who have dual citizenship. I'm sorry if this is unfair, but the world's not fair. If you are in that situation, I would put absolutely zero faith in your fellow citizens rallying to your cause. First, I would never, ever, expect "fellow citizens rallying to my cause". This isn't about sympathy or fairness, it's about theft and greed. Governments have no issue taxing their citizens to death (or confiscating their gold), but they absolutely hate it when someone else tries to steal from their citizens. I don't expect France and other foreign nations to come to my defense because it is the right thing to do. I expect them to do so because they want the gold. If someone is going to steal the gold of French Americans, why should it be the US? By confiscating the gold of French Americans, the US would be stealing from France. Since France and countries around the world are having its own economic/financial difficulty, they will react very violently and hostility to the theft of their gold. If you accept that governments have a right to confiscate their citizen's gold, then foreign nations have claims against the roughly 40 million Americans who are eligible for dual citizenship. They are unlikely to give up these claims without a fight. Also, there are millions of Americans with dual nationality. Most of these holders of dual nationality come from cultures that value gold far more than Americans do (European, India, Israel, etc...). Third, holders of dual nationality are much more likely to have had experience with currency collapses, whereas many US citizens, because of the depression, are focused on deflation. 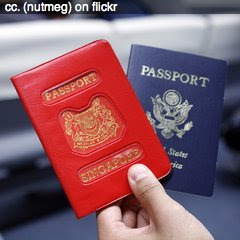 Finally, international businessmen and other wealthy individuals are disproportionally likely to possess dual nationality. Combined, this means that a large quantity of gold is in the hands of Americans with dual nationality. Finally, if the US did try to confiscation, families are likely to turn over their gold holdings to trusted family members or friends with dual/foreign citizenship in an effort to protect their gold and get it out of the country. Since nearly every Americans has at least one friend or family member with dual/foreign citizenship, this means for any US confiscation efforts to be successful, the US has to be willing/able to steal the gold of foreign citizens. I would be absolutely amazed if the foreign nations stood by and did nothing while several thousand tons of gold were being stolen from their citizens. This entry was posted in Background_Info, Currency_Collapse, Gold. Bookmark the permalink. Gold confiscation would immediately spike the price of silver. Doubtful the feds would want that to happen as well. "... and the American voters are unlikely to tolerate any gold confiscation which excludes dual citizens. Hence, no gold confiscation." I guess that could no exist voters at the end, but only subordinates. I don't think gold confiscation is likely either, but the dual citizenship argument is pretty weak. If you were to draw a Venn diagram that included dual citizens and holders of gold, the intersection would probably consist of one person - Eric deCarbonnel. I am exaggerating, but my point is there would be so few individuals involved that there would be exactly zero outrage. There were people who had double citizenship back in the 30's too, and I don't think they got away with owning gold. After all, they WERE American citizens, so the confiscation applied to them no matter what other citizenship they had. Also, leaving the US with a non-US passport may not be legal if you are a US citizen (I don't know if this happens in the US, but I do know that this is not legal in some countries like Argentina). Nowadays you can't expect to be able to smuggle your gold out of the US: it will be easily detected by the Customs. You say there would be an enormous need for gold from the US government, and that there would be scant gold to confiscate so such an unpopular directive would not be worth it. But consider the fact that such a measure would be very effective in forcing the people to accept and store value in any new currency that replaces the Dollar. Also remember that the US Congress law that delegates power to the President to confiscate gold is still in full effect. (Such power is probably unconstitutional but this is untested because it never reached the Supreme Court, and the Supreme Court CAN be rigged if the need arises). All that is needed is a new executive order by the President declaring a new emergency (and this whole economic crisis can easily be called that). So there you go: all that is needed is a stroke of the pen, and your gold is good as gone. Sorry to blow up your little hope bubble, but I don't think it would be wise to trust your ability to keep your gold if the impending dollar debacle occurs as envisioned. The risk is too high. Jeff, as many as 40 million Americans are eligible for dual citizenship. Considering the fact that many cultures value gold far more than we do, I think it is quite obvious dual citizens could have a substantial impact on gold leaving the country. Also, to the person above me, ever tried to smuggle anything past customs? Don't assume they would find anything. Airport security/customs is not that effective. I don't think smuggling gold past Customs would be an easy task. First of all, it's a metal. I guess it could be detected by the metal detectors right away, couldn't it? (perhaps not, since it's not magnetic, I don't know). Besides, any reasonable amount would take significant volume so it would not be easy to hide. And the risk of detection could be very high, not only because of its probability as discussed, but because the impact of it being discussed could be devastating: you could be imprisoned, a steep fine could be imposed, and the gold would be confiscated right away. Unless you live near the continental US borders, trickling the gold out of the country would be impossible, so most probably you would be risking confiscation of a large part of your gold on each trip. I'm pretty sure they're already confiscating gold in a back door kinda way. Government sponsored enterprises such as cash4gold are buying the citizen's gold for pennies on the dollar. I mean, how else does a no name company afford a Superbowl ad? I doubt it would ever extend to armed guards conducting house to house searches for coins hidden in people's mattresses.. I can see gold held in vaults in the US being forcibly purchased by the government and I don't think it's at all unlikely that some measures might be taken to try and limit the free trade of gold which would help to limit it's value. If it became impossible to legally exchange gold for dollars at a free market rate then it would seriously limit the usefulness of gold as a currency. The dual passport argument is really short sighted - as people have already pointed out getting any gold out of the country past customs if doing so were itself illegal is a total non-starter. You might as well be investing in cocaine instead - it's more useful as currency on the street too. can someone provide some reference material on the best way to take gold and silver out of the country. I've heard it Can/Cannot be detected by metal detectors. that bars will be detected and coins not. in short, there is so much confusing and contradictory information, I'm curious to read more about physically taking it out now. Moroever, I'm curious to know about what's the best way to go to other countries and deposit the gold safely. Is Switzerland still safe? Would Austria be better? What about other recent creditor nations? Can one just as easily take one's gold out with them when they would like to? again, any references would be great. these questions have gone unanswered on too many forums for too long :) please share your thoughts about coins and bars (kg, not 400 ozers). Actually.. if the US govt really wanted to discourage physical gold speculation what they aught to do is start manufacturing loads of nearly perfect fake gold bars and coins. Sell them on ebay.. maybe distribute them to coin and jewelry shops. This would destroy confidence in gold.. your average person realistically has no way to tell if the gold is real or not. This wasn't such a problem in years gone past because it would have been hard to make a convincing fake. These days I suspect that it would be much easier. There's no need to take your gold out of the US physically. You're making this too complicated. All you need to do is sell it today, turn aound, and buy it tomorrow in Zurich, where it can be vaulted. Of course, you'll lose a little on the spread, unless you time it right. Then you could actually make money on the transaction. You can even do this online quite legally. Both GoldMoney and BullionVault offer this service. Then, if you wish to take possesion or spread it around, simply hop a flight to Zurich the next day and handle your gold storage yourself. Never hold wealth, investments, or too much local currency in the country that you live in. Pluto's comment is +1 insightful. But you have to act now, before any confiscation happens. 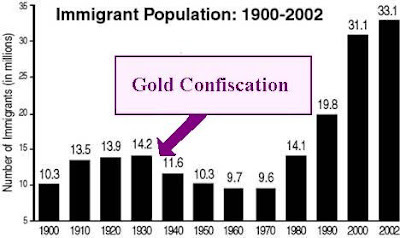 I have updated this entry on gold confiscation. See above. I'm not sure I buy the argument that there is "not enough confiscatable gold available to make a difference". If the US government declares bankruptcy, with a worthless dollar, all the world will buy up US property, factories, homes for next to nothing. The Chinese are doing that now - with depressed US housing stock. The US government then would not require that much gold - since it's scope of operations would be vastly smaller after the above "fire sale". So what little gold they could get their hands on - might just suffice to partially anchor a new US dollar - coupled with some other assets like land or contracts on industrial output. So in my view - a bankrupt US government could EASILY confiscate gold bullion. Today US nationals don't need dual citizenship to store gold in foreign vaults (as many are now doing). 1: Requiring US nationals to move that gold physically home to the US would be out of the question. 2: They'd have to force you to cash it in and send the proceeds to the US Treasury. 3: More likely - they'd pressure foreign banks to impound any gold held in the name of US nationals - and work out a gold-swap behind the scenes. Said banks would then have to query bullion agents using their vaults (BullionVault.com etc) to provide these names - and voila. 4: I personally never underestimate the creativity of the government to do just about anything. On the idea that foreign governments would never cooperate with Washington on gold confiscation - consider this. Washington will simply say - "look, play ball with us on this or you''ll never likely see the US recover as a viable customer for your exported European goods, cars etc". What's a little larceny among friends ? I'm not the "Robert" at the top of the blog - so I'll differentiate myself by signing my self "Rob W". Gold and all PM will definitely be confiscated. Once the run on the dollar and most fiat currencies takes off all trading in all markets will be halted. The government will have no choice-you think they are going to give up their power to spend and control?-never never never!!! the PM ETFs will be liquidated at the last paper money price. As the fiat will be flowing into all tangibles/commodities, anti hoarding orders will be enacted-these will be mainly aimed at large speculators but many high profile private individuals will be targeted. No food hoarding, no PM hoarding. But no house to house. Except a few for show to scare people into giving up their gold. Eric is way off thinking there's only 100 tons or so to be had by govt. In the U.S. there is estimated by the WGC to be 15000 tons in private hands, mostly jewelry (CBs hold only 20% of the world's gold) Big bankers hold quite a bit too-probably off balance sheet. Right now we are seeing a great deal of that jewelry/scrap being sold-1100 tons last year according to the wgc. those numbers will increase. "gold in the hands of the people is the enemy of the state" Adolph. Karl said something similar and our govt borrows the ideas of both. But we can protect ourselves from this invevitablity. Marrying a foreign national might be a good idea. But be wary of storing gold overseas anywhere unless you intend to live there and feel that they won't confiscate their citizens gold. You're better off with midnight gardening. Even in 1933 people were legally allowed to keep 5 ozs. of gold. We'll be allowed to keep small amounts and possibly that which is considered jewelry or numismatic. BTW Am eagles are sold as numismatic coins and pre 1933 coins are also considered as such. (note the rising premiums for pre 1933 gold $20 coins in avg condition). So they both likely may be exempt from the rules as it might be a bit much to go after the average citizen who bought them as such. No it'll be bullion bars and ETFs and possibly large hoards of krugerrands. same for silver this time. Any gold in fort knox leased out or not will become us govt property by the stroke of a pen. How else can you protect yourself? Jim Sinclair says buy gold miners HQd in another country whose assets are in a third country-that's seems to be a good strategy and by all means hold the certificates in your possession. There will be no one way to protect oneself from the bankrupt socialist/fascist, big brother, supernanny state. So you have to try and cover all your bases. And don't expect any stocks or 401ks and IRAs to be safe either the govt will take it all rather than close shop. If they can they will-bank on it! "But we can protect ourselves from this invevitablity. Marrying a foreign national might be a good idea." Could someone please tell me if taking gold out of the country is per-se illegal right now? If not, could you please tell me how to report the gold to customs? Thanks so much! Not in the countries I live. As for physical gold, the market was manipulated and now cornered by gold EFTs, and the information about gold is now deliberately distorted to force people out. To gain something on gold, you need to look into 10+ years time scale. I bought my gold at usd 250 and sold most of it at usd 900 taking instead platinum and palladium, as I believe they they rally when this phase is over. I am tempting to by silver when gold/silver ratio hit above 80. I have read nice article recently about this ratio in last known grand depressions. When s*it hits the fun, it is time to buy physical silver, as most folks soon realize that they can't buy gold (for the reasons above or simply just because they need money for bread and milk) and run into silver coin shops. By the way, can you recommend one? The other possibility is concealed in the hidden reserves of the Fed's gold position, which is only valued at $42.44 per troy ounce on the balance sheet. A revaluation of the gold reserves would boost the equity ratio of the Fed to 12.35%. The Fed, ironically named "...Reserve", along with FOMC, deliberately misleading name "..Open Market" are nothing more than negotatiating platform (by arbitraging) between the government and the private money. Either calls to save the Fed or abolish the Fed is nothing more then deceptive flush from the big boys (private money). The Fed is also acting as diplomat channel from them to the government, allowing to obscure this channel from the public. Thus, you can't save the Fed, it will be always another Fed as long current socio-economic model exist. "Abolish"=change Fed means open confrontation between the government and private money, it can trigger a social revolution when either party appeal to the public for ultimate judgement. Don't have much too add (just found marketskeptics and am impressed / will visit often), and am a relatively new investor, but I figure the best solution concerning this issue is to diversify. I have a few gold bullion coins in my possession along w/ some junk silver, but also have more stored w/ Via Mat in Zurich (through both bullionvault and goldmoney). Figure my main risks w/ the local stuff is confiscation and/or theft (I'm not gonna go as far as burrying it), where as the risks with the foreign stuff is swiss confiscation (less likely than local confiscation probably) as well as crooked books. Anyways, keep up the good work! Marc Faber said recently that it's best to hold physical and store it in a safe deposit box in a Singapore or Thai bank. All money is a form of storage for wealth of safely storing todays hard work for use in the future. It doesn't matter what is used as money. It only matters if people have confidece it the mediam of exchange. Few if anyone still views anything the federal government issues with any form of confidence. In fact they are the ones causing a crisis in confidence and thus with all the lies and stealing (aka printing money or making it out of thin air) It is inevitable that there will be a crash, but to put your confidence in Gold is also a dillusion. This entire way of life is going to quikly come to and end. put your faith in something worth putting faith in. Quit worrying about a possible confiscation. Gold dealers don't report individuals that bought gold from them. Just use a fake name, address and a phone number and you will be fine. And if the order ever does come down, just do some midnight gardening and you will be fine. And even if it gets outlawed as a legal tender for one reason or another the operatives on the black market will always be more than willing to trade with you for stuff. Use your head people. You all act like you have to give it up, because the government says so. Take my advice and you'll be fine. You just need to do some midnight gardening and your gold will be safe. Just remember that dealers don't require real names phone numbers or addressess when buying gold from them. And definitely don't keep it in the safety deposit box. Stash it someplace safe. So no one knows that you even have it. Use your heads people, Think.